At the Community Development Alliance Scotland’s conference this week, a recurring theme was the need to change attitudes and behaviours if communities are to become more engaged and empowered in decision-making. The speakers, from Keith Brown MSP’s Ministerial address to workshops by the new economics foundation, weren’t just talking about planning and placemaking, of course. But there was a huge amount in common with the culture change agenda that’s so fundamental to Scottish planning reform – not least the need to be more enabling and more facilitative. Quite apart from the fact that planners and community development professionals are both in the business of making sustainable communities. What struck me at the conference was not only the absence of planners and urban designers there – I was the only one – but also how much we could achieve if we worked more closely with our community development colleagues. This isn’t just about learning from each other, important though that is. It’s about joining forces to build stronger, more sustainable communities. We as planners struggle to get beyond physical change in our work: just pick up almost any development plan or masterplan, and you’ll see that the focus is on buildings and land. Regeneration attempts to bridge the gap to social and economic initiatives – as promoted through the admirable work of the Scottish Urban Regeneration Forum. But even in regeneration, there is too often a divide between physical proposals and social/economic/community initiatives. We’re just not very good at stitching these things together. 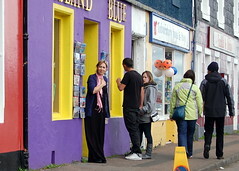 On town centre strategy projects I’ve recently been involved with, in Strathaven, Paisley, Lanark, Glenrothes and Maryhill (Glasgow), with WMUD, Kevin Murray Associates and yellow book, we’ve been trying to integrate physical change with economic and community initiatives. It’s not easy, partly because different people are responsible for different bits – transport planners, community development workers, urban designers, enterprise support workers. But I believe it’s also because there isn’t generally much contact between the built environment professions and those involved with economic and social service initiatives – especially those working from a community development perspective. There are notable exceptions of course. 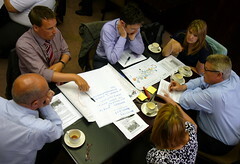 Planning Aid for Scotland’s new mentoring project provides ongoing support to community groups on engaging with the planning system. And the Neilston Renaissance Town project promises to fuse community development with physical placemaking changes. But we need to embed these kinds of thinking much more widely. Which is why I was so struck by the discussions at the community development conference this week. Here was a hall full of people who were facing exactly the same challenges that built environment professionals face, and who were trying to achieve the same goal of building sustainable communities. Many of them work in local authorities – community learning, social work; others in the voluntary sector and in health boards. They have contacts and knowledge of how communities work. They have enthusiasm and energy, and want to make a difference. What a resource for raising our game in preparing and implementing Local Development Plans, masterplans, development frameworks and action plans. Just think – if we linked up with the community development world, we might start to plan truly sustainable communities. the Big Society | what does it mean for planning?